Winston is a small village situation conveniently just off the A67 between Barnard Castle (5 miles) and Darlington (11 miles) in the south west of County Durham. 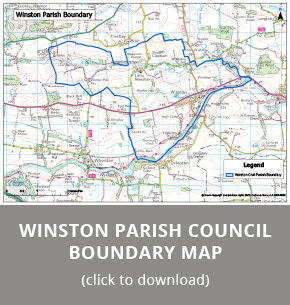 We hope you find this site useful if learning more about our village, the facilities within and near to it as well as learn more about the role of the Parish Council. The Local Audit and Accountability Act 2014 detailed new audit arrangements for parish councils like Winston Parish Council with an annual turnover not exceeding £25,000. Such councils are subject to new transparency requirements to give local people the information they need to hold local public bodies to account. Click here for more information.